Viewed 40 times in last week. More about this property: Escape for a blissful break in the Staffordshire countryside at Blithfield Lakside Barns, choose from six charming 4 star Visit Britain rated cottages at this lovely lakeside setting close to the Cannock Chase Area of Outstanding Natural Beauty, there is plenty to keep all of the family entertained here with a shared games room with pool table, bar football and air hockey and carp fishing and bird watching available on site too. More about this property: Set in an area of outsanding natural beauty in the rolling Cotswold hills near Stow on the Wold is a 7-bedroom converted stone barn with conference facilities available, perfect for corporate groups. More about this property: Escape to the Herefordshire countryside and enjoy a stay in this beautiful high quality 3 bedroom barn conversion, which is part of a collection at Durstone Cottages , sleeping up to 6 in luxurious accommodation, this barn is pet-friendly and enjoys shared access to a games room with table tennis, pool table and football table, what's more it's within easy reach of the Malvern Hills for days out and is only 11 miles from Hereford. Looking for an accessible holiday cottage? Browse through our collection of holiday cottages with accessible features for the disabled. Staying in ground floor accommodation can make a lot of sense if you have special access needs, and you may also be searching for other features such as wheelchair-wide doorways, a ramp, stairlift or a wet-room with grab rails. See ads for details of the disabled accessible features available at each cottage. The best cottage to suit you will depend on your own specific access requirements. We recommend that you always speak to owners or agencies before booking to ensure that any holiday cottage fully meets your access needs. If you want to find a holiday cottage that has been assessed in terms of its accessibility, choose a cottage that has signed up to the National Accessible Scheme and has obtained a yellow badge and a mobility impairment or visual impairment rating. We hope you find the ideal disabled accessible cottage for you. Click on the following heading to view a list of holiday cottages, villas, log cabins and apartments with facilties for people with disabilities. 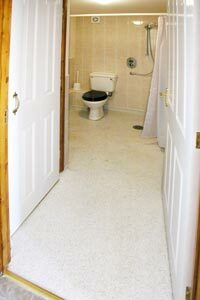 Holiday cottages with a wet room - essential for many people with walking disabilities. The cottages and self catering apartments listed below have some facilities for the disabled, discuss your special needs before booking. Please click on the country of your choice to display cottages and accommodation with wheelchair access and other facilities for the disabled.